Nest-building in primates refers to the behaviour of building nests by extant strepsirrhines (lemurs and lorisoids) and hominid apes (gorillas, chimpanzees, orangutans, and humans). Strepsirrhines build nests for both sleeping and also for raising families. Hominid apes build nests for sleeping at night, and in some species, for sleeping during the day. Nest-building by hominid apes is learned by infants watching the mother and others in the group, and is considered tool use rather than animal architecture. Old World monkeys and New World monkeys do not nest. It has been speculated that a major evolutionary advance in the cognitive abilities of hominoids may first have occurred due to the development of nest-building behaviour and that the transition from nest-building to ground-sleeping led to "modifications in the quality and quantity of hominid sleep, which in turn may have enhanced waking survival skills through priming, promoted creativity and innovation, and aided the consolidation of procedural memories". Strepsirrhines may be nocturnal, diurnal, or crepuscular. Some may either occupy holes in trees or build nests. Unlike the hominid apes, strepsirrhines build nests by instinct and use them for breeding purposes. Strepsirrhines mothers either carry their young on their bodies, conceal their young in foliage while they venture out to feed, returning periodically to feed and groom them, or leave them in a nest built for that purpose. Some strepsirrhines, such as mouse lemurs, build nests. Among lemurs, females of smaller species, such as the mouse lemur and giant mouse lemur, build leaf nests before birth for the protection of young. Leaf nests in golden-brown mouse lemurs may provide thermoregulation benefits. Male mouse lemurs have been found sharing nests with up to seven females at a time during the mating season. In the Ruffed lemur (Varecia variegata), nests are made from locally collected material and may also be lined with hair plucked from their own body. In larger lemur species such as the Verreaux's sifaka, ring-tailed lemur and common brown lemur, the young cling to the mother and nests are not built. Aye-ayes, being nocturnal, build oval-shaped nests from nearby branches and lianas for day time use. These may be built in a tangle of lianas or in a fork of a tree, at a height of 7 to 20 metres (23 to 66 ft) above the ground. These nests may be re-used by other aye-ayes once the original occupant moves on. A single occupant uses a nest for a few days, refreshing it regularly with fresh vegetation. Aye-ayes build and use many nests—during one study, 8 aye-ayes were recorded to build and use as many as a hundred different nests over a period of 2 years. Lesser bushbaby mothers initially shelter their offspring, usually twins, in a nest or tree hollow, later concealing the infants in foliage while they forage at night. In some species, such as dwarf galagos, the day-sleeping nests may be shared by groups of females or occasionally by visiting males. Hominid apes construct nests during the day or by night, primarily for resting. The nests are not built using instinct but through behavioural patterns which are learned by the young from their mother. Nest building is habitual behaviour, and nest-counts and faecal analysis at each nest site can be used to estimate hominid ape population counts and composition. In the case of orangutans and chimpanzees, social influences are probably essential for the animals to develop successful nesting-behaviour. Gorillas construct nests for day and night use. Day nests tend to be simple aggregations of branches and leaves on the ground, while night nests are more elaborate constructions usually on the ground but sometimes on trees, especially those of juveniles and females in areas submitted to a high poaching pressure. The nests may be 1 to 5 feet (0.30 to 1.52 m) in diameter and are constructed by individuals. Young animals nest with their mother but do not construct nests until three years of age, initially in close proximity to their mother. Gorilla nests are distributed randomly and the tree species used appears to be opportunistic. Nest-building is seen in chimpanzees and bonobos who construct arboreal night nests by lacing together branches from one or more trees. They also can build nap nests to rest in the afternoon, these are usually more poorly constructed than the night nests and can be built both on the ground and on the trees. At some research sites such as Bili forest, in Congo, chimpanzees can build a significant proportion of their night nests on the ground. Nests consist of a mattress, supported on a strong foundation, and lined above with soft leaves and twigs. Nests are built in trees which have a minimum diameter of 5 centimetres (0.16 ft) and may be located at a height of 1 to 45 metres (3.3 to 147.6 ft). Day and night nests are built. Nests may be located in groups. 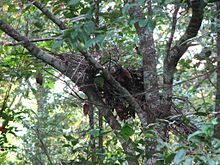 Orangutans build day and night nests. Young orangutans learn by observing their mother's nest-building behaviour. Nest-building is a leading reason for young orangutans leaving their mother for the first time. Starting at 6 months of age, orangutans practice nest building and gain proficiency by the time they are 3 years old. Initially, a suitable tree is located: Orangutans are selective about sites even though many tree species are utilised. The foundation is then built by pulling together branches under them and joining them at a point. After the foundation has been built, they bend smaller, leafy branches onto the foundation; this serves the purpose of and is termed as the "mattress". After this, orangutans braid the tips of branches into the mattress. This increases the stability of the nest and forms the final process of nest building. Orangutans may add additional features such as "pillows", "blankets", "roofs" and "bunk-beds" to their nest. Orangutans make "pillows" by clumping together leafy branches with the leaves in the centre and the twig shoots pointed outward. They bite the twigs to blunt sharp ends. Pillows are added to night nests but are usually absent from day nests. A "blanket" consists of large leafy branches with which orangutans cover themselves after lying down. Orangutans may create a waterproof overhead shelter for the nest by braiding together a loose selection of branches. They may also make a "bunk-nest" or "bunk-bed", a few metres above the main nest. A study on the phylogeny of primate behaviour has revealed that the use of tree holes or nests are important in the life-history strategies of many strepsirrhine species and some New World monkey species. Alternative strategies of infant care which involve carrying the infants rather than leaving them, have evolved several times but have reproductive costs and generally slower rates of population increase than species which build nests. ^ a b c d e f Didik, Prasetyo; Ancrenaz, Marc; Morrogh-Bernard, Helen C.; Atmoko, S. Suci Utami; Wich, Serge A.; van Schaik, Carel P. (2009). "Nest building in orangutans". In Wich, Serge A.; Atmoko, S. Suci Utami; Setia, Tatang Mitra (eds.). Orangutans: geographic variation in behavioral ecology and conservation. Oxford University Press. pp. 270–275. ISBN 978-0-19-921327-6. Retrieved 5 July 2011. ^ a b Marchant, Linda Frances; Nishida, Toshisada (1996). Great ape societies. Cambridge University Press. pp. 226–227. ISBN 978-0-521-55536-4. Retrieved 4 July 2011. ^ Mazur, Allan (2005). "Primates". Biosociology of dominance and deference. Rowman & Littlefield. p. 53. ISBN 978-0-7425-3693-7. Retrieved 1 January 2012. ^ Coolidge, Frank L.; Wyn, Thomas (2006). "The effects of the tree-to-ground sleep transition in the evolution of cognition in early Homo" (PDF). Before Farming. 2006 (4): Article 11, pp. 11–18. doi:10.3828/bfarm.2006.4.11. Retrieved 6 July 2011. ^ a b c Institute for Laboratory Animal Research (U.S.). Committee on Well-Being of Nonhuman Primates (15 June 1998). The psychological well-being of nonhuman primates. National Academies Press. p. 57,63–64. ISBN 978-0-309-05233-7. Retrieved 5 July 2011. ^ Izard, M. Kay (2006). "Nursery-reared Prosimian Primates". In Sackett, Gene P. (ed.). Nursery rearing of nonhuman primates in the 21st century. Ruppenthal, Gerald C. & Elias, Kate. Birkhäuser. p. 111. ISBN 978-0-387-25632-0. Retrieved 1 January 2012. ^ Thorén, S.; Quietzsch, F.; Radespiel, U. (2010). "Leaf nest use and construction in the golden-brown mouse lemur (Microcebus ravelobensis) in the Ankarafantsika National Park". American Journal of Primatology. 72 (1): 48–55. doi:10.1002/ajp.20750. PMID 19787662. ^ a b Dixson, Alan F. (26 January 2012). Primate Sexuality: Comparative Studies of the Prosimians, Monkeys, Apes, and Humans. Oxford University Press. p. 137. ISBN 978-0-19-150342-9. Retrieved 28 April 2013. ^ Bateson, Paul Patrick Gordon (1991). The Development and integration of behaviour: essays in honour of Robert Hinde. Cambridge University Press. p. 206. ISBN 978-0-521-40709-0. Retrieved 9 July 2011. ^ Sauther, Michelle L. (2006). Lemurs: ecology and adaptation. Springer. p. 175. ISBN 978-0-387-34585-7. Retrieved 9 July 2011. ^ Petrie, Kristin (1 January 2010). Aye-Ayes. ABDO. p. 9. ISBN 978-1-60453-735-2. Retrieved 1 January 2012. ^ Fleagle, John G. (1999). Primate adaptation and evolution. Academic Press. p. 114. ISBN 978-0-12-260341-9. Retrieved 10 July 2011. ^ Hansell, Michael Henry (2007). Built by animals: the natural history of animal architecture. Oxford University Press US. p. 211. ISBN 978-0-19-920556-1. Retrieved 9 July 2011. ^ Setchell, Joanna M.; Curtis, Deborah J. (14 March 2011). Field and Laboratory Methods in Primatology: A Practical Guide. Cambridge University Press. p. 126. ISBN 978-0-521-14213-7. Retrieved 9 July 2011. ^ Miller-Schroeder, Patricia (1997). Gorillas. Weigl Educational Publishers Limited. p. 20. ISBN 978-0-919879-89-8. Retrieved 4 July 2011. ^ Wrangham, Richard W. (1996). Chimpanzee cultures. Chicago Academy of Sciences, Harvard University Press. pp. 115–125. ISBN 978-0-674-11663-4. Retrieved 2 July 2011. ^ a b Kappeler, Peter M. (1998). "Nests, Tree Holes, and the Evolution of Primate Life Histories". American Journal of Primatology. 46 (1): 7–33. doi:10.1002/(SICI)1098-2345(1998)46:1<7::AID-AJP3>3.0.CO;2-#. PMID 9730211. ^ Ross (1991). "Park or ride? Evolution of infant carrying in primates" (abstract). International Journal of Primatology. 22 (5): 749–771. doi:10.1023/A:1012065332758. Retrieved 2 February 2012. National Geographic image of Aye-aye on nest with caption "An aye-aye wakes in its arboreal sleeping nest to begin foraging." This page was last edited on 5 February 2019, at 22:28 (UTC).